We have so many undefined mysteries around us and every mystery have scientific reasons. Galaxy is full of mysterious place. One of the major mysteries is “Black Hole”. Black hole is anything but empty space. It is a great amount of matter packed into very small area - think of star ten times more enormous than Sun squeezed into sphere. Reason is a gravitational field is so strong that nothing, not even light, can escape. In current years, NASA instruments have painted new picture of these odd objects, the most fascinating objects in space. Black hole is region of space-time from which gravity stops everything, including light, from escaping. Around a black hole, there is a mathematically defined surface known as an event horizon which marks point of no return. Hole is known "black" as it absorbs all light that hits horizon, reflecting nothing, just like perfect black body in thermodynamics. Although the term was not invented until 1967 by Princeton physicist John Wheeler, idea of object in space so enormous and thick that light couldn’t escape it has been around for centuries. Most prominently, black holes were forecasted by Einstein's theory of general relativity that illustrated that when enormous star dies, it leaves behind small, dense remnant core. If core's mass is more than about 3 times the mass of the Sun, equations demonstrated, and force of gravity overwhelms all other forces and creates a black hole. Scientists can not directly examine black holes with telescopes which identify x-rays, light, or other forms of electromagnetic radiation. We can, though deduce occurrence of black holes and study them by discovering their effect on other matter nearby. If black hole passes through cloud of interstellar matter, for instance, it will draw matter inward in process called as accretion. 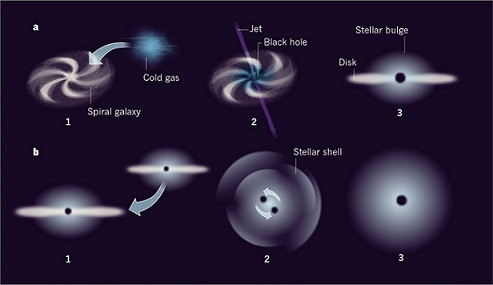 Similar process can happen if normal star passes close to black hole. In this case, black hole can tear star apart as it pulls it toward itself. As attracted matter accelerates and heats up, it releases x-rays which radiate into space. Current discoveries present some tantalizing evidence that black holes have dramatic influence on neighbourhoods around them - releasing powerful gamma ray bursts, consuming nearby stars, and urging growth of new stars in some areas while stalling it in others. One Star's End is starting of Black Hole's. Common kind of black hole is created by certain dying stars. Star with mass greater than about twenty time’s mass of our Sun may create a black hole at the end of its life. Most black holes form from leftovers of large star that dies in supernova explosion. If total mass of star is large sufficient, it can be proven theoretically that no force can keep star from failing under influence of gravity. Though, as star collapses, strange thing happens. As surface of star nears the imaginary surface called "event horizon," time on star slows relative to time kept by observers far away. When surface reaches event horizon, time stands still, and star can collapse no more - it is a frozen collapsing object. Even bigger black holes can result from stellar collisions. Soon after its launch in December 2004, NASA's quick telescope observed powerful, fleeting flashes of light called as gamma ray bursts. Chandra and NASA's Hubble Space Telescope afterwards gathered data from event's "afterglow," and together observations led astronomers to conclude that powerful explosions can effect when black hole and neutron star collide, creating another black hole. Star is a huge sphere of gas which creates its own light by producing its own energy. It creates this energy throughout nuclear fusion in its core, by using as fuel the elements which make it up. Fusion in star combines atoms of lighter elements, like hydrogen, into different, heavier elements, like helium. Massive star can burn its fuel into elements as heavy as iron. Nuclear fusion starts when star is fully formed out of a nebula and ends when a smaller star burns out and becomes a white dwarf or when a massive star's iron core collapses in a supernova. As a composition of star changes as it burns its fuel, it goes throughout a series of stages in the course of its life, hundreds of millions or billions of years long.